Feel the wind in your hair and sun on your face as you skim across the water on a 500hp inflatable Ribcraft boat. 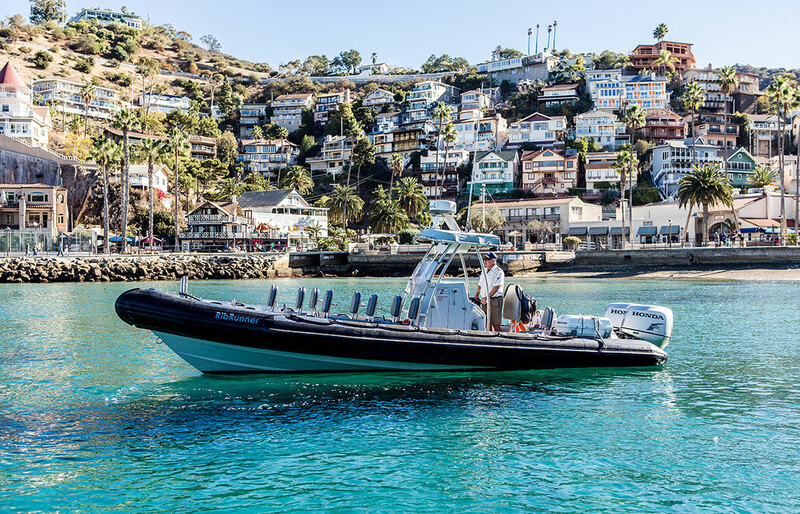 You’ll get a unique perspective of Catalina’s diverse marine environment on this exhilarating high-speed adventure on the Catalina Channel, where you’ll have the chance to experience the thrill of watching dolphins and sea lions frolic in their natural environment. Passengers must be at least 5 years old, and children under 9 must sit on the rear bench seat with a parent or guardian. Not recommended for expectant mothers, people with back or neck issues, or those who are susceptible to motion sickness. Prices are subject to change without notice. Prices do not include Avalon City Admissions Tax or Harbor Use Fees. Tours and times subject to change. Must be five years old or older to participate.